Yep... yet another banana bread recipe. Why not? 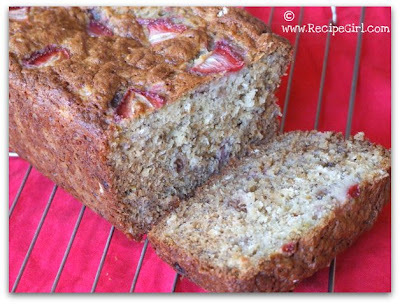 You always have those aging bananas ready to draw fruit flies sitting on your counter, so mix those with some ripe & juicy strawberries to try a new recipe: Strawberry- Oatmeal Banana Bread. I drew inspiration for this bread from Chuck at CookingBread.com. If you haven't checked out his droolworthy blog, you're missing out. The guy knows his bread. Knowing that, I dared to mess with his recipe and create my own. 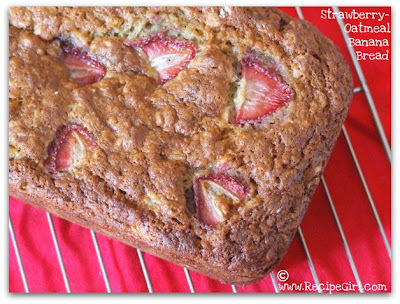 I haven't had a whole lot of "luck" with making strawberry breads in the past as I find that strawberries tend to lose a lot of their flavor in the baking process. So for this bread, I purchased some very special French strawberries from my local farmstand (Chino Farms.) I asked the guy what the difference was between the $3 and $5 baskets. He had a difficult time explaining how wonderful the French ($5) ones were, so he popped one in my mouth and let me decide for myself. Oooo la la... the farmer was right. Those French people did something to these strawberries that make them in a class all their own. A bit more petite, juicier and waaaaaay more flavorful than your average everyday strawberry, they were definitely worth the extra $2. Kind of a splurge, but I was sold when I tasted them. We only got to eat a few, because the rest went into this bread. 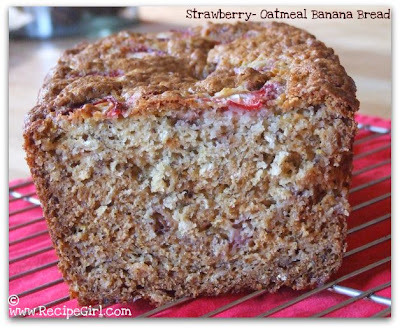 The result: A good, moist banana bread with a slight strawberry flavor. I have a feeling though that if you don't have really juicy, flavorful strawberries, you might not get much flavor in the bread from your berries. You don't have to use fancy French strawberries, but keep on the lookout to try them sometime. Of course you could always try this with raspberries or blueberries or some other kind of berry that you have access to. Enjoy with a cuppa coffee.